Two genuine crusaders of humanity and wellbeing for all – Bhai Sahib Ji (Chairman GNNSJ (UK)) and Sr. Placida McCann (Director of LWHC) share a special inspired moment after the launch event. Friday 24th August 2012 marked an auspicious day with the opening of a new Vocational Training Centre at the Living with Hope Centre (LWHC) in Kericho, Kenya, supported and partnered by Guru Nanak Nishkam Sewak Jatha Gurudwara (Birmingham)(GNNSJ), Nishkam Hope (Kenya) and Nishkam Sant Puran Singh Institute (NSPSI) to help provide accessible, sustainable and quality vocational services to many Kenyans. It was also day two of a big Medical Camp to provide medical aid to locals at NSPSI. 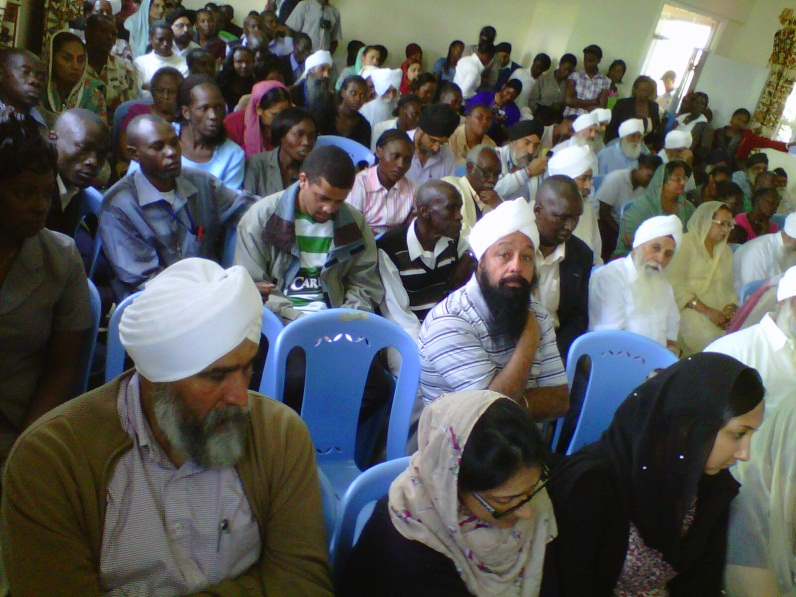 Over 70 members of the congregation from the GNNSJ (UK) and Nishkam Centre in Handsworth made their way to a remote town called Kericho in Kenya to partake in a spiritual service and in opportunities to serve humanity. The Nishkam Centre was pleased to assist with organising a collection of spectacles and sunglasses for the Medical Camp that took place on the 23rd and 24th August 2012 in Kericho. The professionals came from Kericho District Hospital, Lions Sightfirst Eye Hospital, Live with Hope and volunteers from the NSPSI. The Live With Hope Centre (LWHC) exists to empower and promote a harmonious community with improved quality of life through provision of accessible and sustainable quality healthcare services, creation of HIV / AIDS awareness and resource mobilisation. GNNSJ (Kenya), Nishkam Hope and NSPSI are key partners playing a crucial role in realising the broader vision of serving all humanity. NSPSI provides much needed education to those who would otherwise have to do without. GNNSJ (Kenya) ensures that all work across Kenya is carried out in the same professional, values driven, systematic way as the work done in the UK and worldwide by GNNSJ (UK). The need for self-sustainability has been highlighted numerously during the life of the LWHC projects. The strategic partnering work of LWHC, GNNSJ (Kenya) and Nishkam Hope bring an inspired team together to deliver much needed services to the locals. The launch of the new Vocational Centre included a short prayer to bless the project with a speech by the Chairman of GNNSJ and the Nishkam Civic Association, Bhai Sahib Bhai (Dr) Mohinder Singh. Bhai Sahib is firmly committed to education and equipping individuals with values as an important ingredient for empowering people to be self-sufficient, self-reliant and proactive members of society. The Director of the LWHC, Sr. Placida McCann who has worked tirelessly to bring the project to life, seemed to be thrilled with the proceedings. The Vocation Centre was officially handed over to the LWHC and the afternoon resumed with celebrations for the new services offered on the health campus which will be a crucial resource for the local community and future generations. If you would like to contribute financially, with expertise, through equipment / material donations or in any other way, please contact us and see what can be done. 1. Guru Nanak Nishkam Sewak Jatha (GNNSJ) is a multi-faceted, faith based organisation practicing and propagating the Sikh Dharam (faith) in the name of Guru Nanak Dev Ji (1469-1539). It has been involved in selfless intra-faith work in Kenya and India informally since 1950, and formally in the UK since 1978 as a registered Charity through five centres for excellence in the inner-city depressed area of Handsworth, Birmingham, where its Headquarters are based. GNNSJ also has sister organisations in Leeds and London (UK); as well as in Kericho (Kenya) and Delhi/ Amritsar (India). Significant achievements have been made by GNNSJ in the conservation and restoration of historical Sikh shrines. 4. The Nishkam Civic Association (NCA) is the civic arm of GNNSJ. More details can be found at www.ncauk.org.